Despite the heated political rhetoric on both sides of the issue, the realities of the changing climate are driving farmers of all stripes to take action. The article, “How to Cope with Climate Change,” then went on to lay out the historical record: increasingly wetter springs, growing severity of droughts, higher-volume downpours. Gullickson pointed out that 97 percent of climate scientists, with the backing of over 10,000 peer-reviewed studies, agree that climate change is happening now and that we humans are the cause. Then he laid the groundwork for positive steps that farmers could take in response. It was a surprising piece, and one some might characterize as brazen, as nearly all of today’s mainstream agricultural leaders tend either to ignore, or vehemently deny, the existence of climate change. Not too long ago it seemed possible that stance might change. Under President Obama’s U.S. Department of Agriculture (USDA), there was a clear focus on reducing the volume of greenhouse gases in the atmosphere as a result of agriculture and food systems. Part of this effort involved integrating the language of “climate adaptation,” “carbon sequestration,” and “climate action” into a great deal of the agency’s materials. USDA budgets were crafted in part around how the agency was approaching the issue. 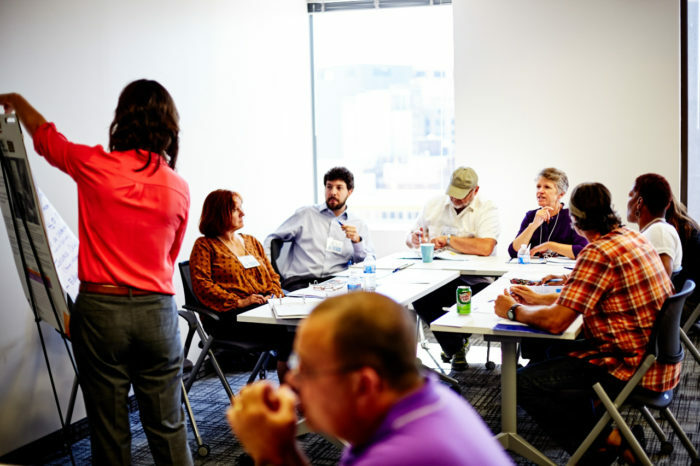 The Climate Hub Initiative convened top agricultural scientists to deliver research and data to farmers and rural communities in need of information. The Guardian uncovered the directive, and published emails from Dr. Bianca Moebius-Clune, Director of Soil Health for NRCS. “We won’t change the modeling, just how we talk about it—there are a lot of benefits to putting carbon back in the sail [sic], climate mitigation is just one of them,” she wrote. But the message was loud and clear: Most conventional farmers don’t want to hear about climate change and this administration wasn’t going to push the envelope. And yet, even as the official line has shifted, the evidence that agriculture is a major contributor to greenhouse gases in the atmosphere—as well the role farm practices can play in both in mitigating and helping farmers adapt to climate change—has only mounted. 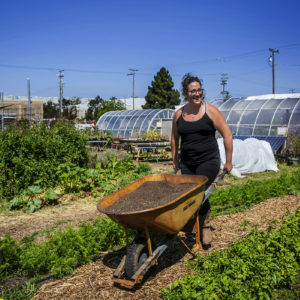 And while some advocates are working to bring the conversation to the fore among rural communities, others are more focused on supporting farmers to change their practices and build healthy soil, regardless of what language they use. A group of farmers discuss weather extremes and recent historical data as part of a Rural Climate Dialogues convening. Photo: Center for Rural Strategies. Today’s changing climate raises serious questions about the viability of agriculture in many of the same regions where it has thrived over the last century (and the places where climate denial is common). Precipitation, temperatures, and atmospheric circulation patterns have changed. So has vegetation. Not only has the West become more drought-prone and arid, but the 100th Meridian—the line that separates the dry cattle-rangeland-and-wheat agricultural zone from the more fertile, productive land used for corn, soy, and pasture—is expanding to the East, changing the landscape for Midwest farmers. According to a new study, around half of rural residents say they “Believe global warming/climate change has affected their community.” But many farmers seem to see it as something that is merely happening, unrelated to the causes most scientists seem to agree on. According to one 2014 study by Purdue and Iowa State universities, only 8 percent of farmers said they believed it was associated with human activities. And 2015 research from Iowa State University found that these opinions are often tied to where farmers received their information. “Farmers who said they trusted environmental groups for information about climate change were more likely to believe [it] was occurring and that it was due to human activity. However, farmers who said they trusted farm groups, agribusiness, and the farm press were less likely to believe climate change was happening and due to human action,” according to Scientific American. The American Farm Bureau Federation (AFBF), one of the more powerful agriculture lobbying groups, rarely mentions the words “climate change.” Their official policy on the topic mainly describes its stance in relation to greenhouse gas regulations. (And, unsurprisingly, they’re opposed to just about all of it.) But the AFBF—and many of the other industry groups it works with—have also actively opposed climate policy and worked to sway the conversation in other ways. Take the federal Waxman-Markey cap and trade bill that went before Congress in 2009 and failed. The AFBF, the National Pork Producers Council (NPPC), and the National Cattlemen’s Beef Association (NCBA) were among a handful of ag industry groups that opposed the bill and actively lobbied to stop it from passing. Chris Clayton, a long-time farm policy and farm economy reporter, points to the election of Barack Obama in 2008 as the turning point for agriculture’s rejection of climate change and climate science.“You had Farm Bureau and NCBA issuing news releases saying EPA was going to tax your cows [for the climate-warming methane they release]. This all came out within weeks of when President Obama won the election, well before he had even named an EPA administrator or anything, and it spread like wildfire,” Clayton said. “You really want to go back and look at ‘fake news,’ that’s the perfect example,” Clayton said, referencing the period. Clayton’s book, The Elephant in the Cornfield, covers the topic. “That thing spread to the point where the cable networks were all covering it,” he said. The documents reveal significant conflicts of interest for the Iowa Farm Bureau and raise questions about whether the Iowa Farm Bureau’s public denials over the existence of climate change and its opposition to classifying carbon dioxide as a pollutant as recently is 2015 is influenced by its extensive investments in Exxon Mobil and Royal Dutch Shell. Not all farm groups are opposed to direct talk about the existence of climate change. “Agriculture is one of the few sectors of the economy where you can actually take carbon out of the atmosphere. Family farmers, with their intimate relationship with the land, have the room to make an enormous contribution,” said Tom Driscoll, Director of Conservation Policy at the National Farmers Union (NFU). “That said, it’s important to understand that farmers and rural people are not homogeneous on the climate change issue. 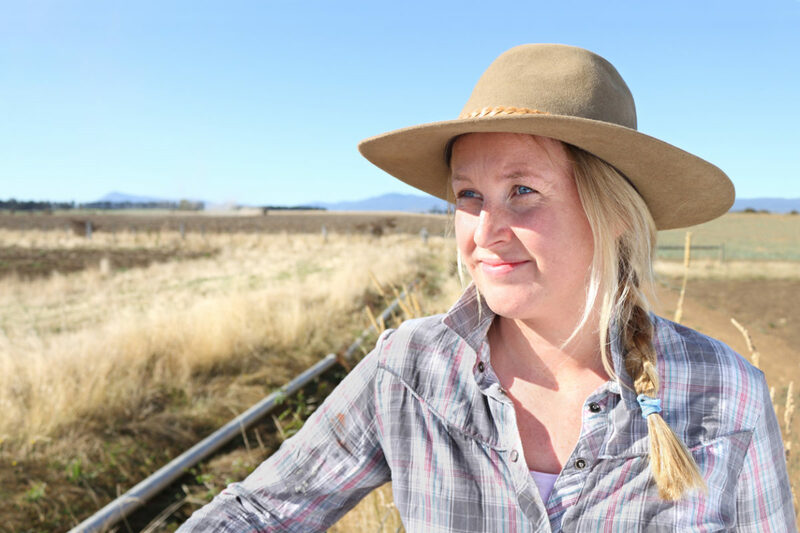 Farmers are just as diverse in opinion as any other population,” Driscoll said. NFU also has a history of engaging on climate change, such as facilitating access to the voluntary carbon credit market and supporting the Paris Climate Accords. The group’s approach, according to Driscoll, is to support information and opportunities that lead to a greater adoption of conservation practices by farmers—many of which can help mitigate climate change. “Our producers, our approach, involves seeing farmers as advocates for the rural communities where they live. This historical identity is what drives the transition to conservation. It’s not necessary that the farmer-to-community relationship be antagonistic,” Driscoll said. 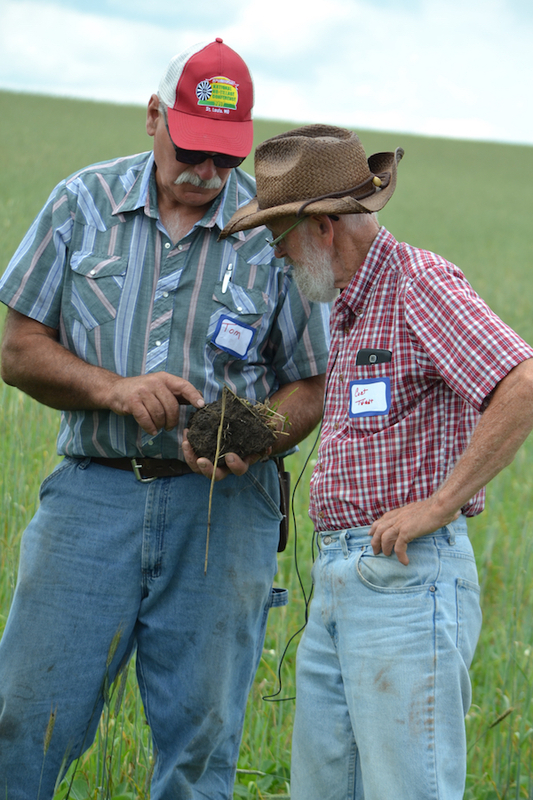 Farmers Tom Pyfferoen (left) and Curt Tvedt examining the soil structure of no-till soybeans in a cereal rye cover crop. Photo: Land Stewardship Program. Take Minnesota farmer Tom Cotter, who has lived the reality on the front-lines of a changing climate. Cotter raises corn and soy for animal feed as well sweet corn and peas for a regional vegetable canning business in Southeastern Minnesota. He is up to date on climate science, and he has thought a lot about how best to communicate with farmers in his community. A member of the Land Stewardship Project (LSP), Cotter is committed to tilling his field much less than most farmers do, using cover crops and planting a wider than average variety of crops. These practices also help him build up his soils with more organic matter, which helps to capture, or “sequester” carbon in soils. 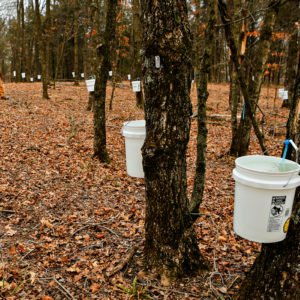 Conveniently, many of these practices are also subsidized as “conservation” practices by the Department of Agriculture. Cotter believes he’s responsible to his neighbors and to others further downstream. He considers the impact of runoff from his land will have on fishermen in the Gulf of Mexico and sees capturing carbon issue in the same light. Why wouldn’t I want to feed my soil and put carbon back in the ground at the same time? That helps everyone,” he said. But not everyone shares that motivation. “Our approach is driven by pocketbook issues for farmers,” said Shona Snater, organizer for LSP’s ambitious “Bridge to Soil Health” Project, which links crop and livestock producers with scientists and other farmers around a soil health community in the Upper Midwest. Rather than using language about climate change, they address soil as a way to help farmers first and foremost stay in business in a tough market. “For us, it’s a blatant, ‘How can I stay on the farm?’ conversation. Soil health is our focus, and many farmers are finding that cover crop and no till systems can cut costs,” said Snater. 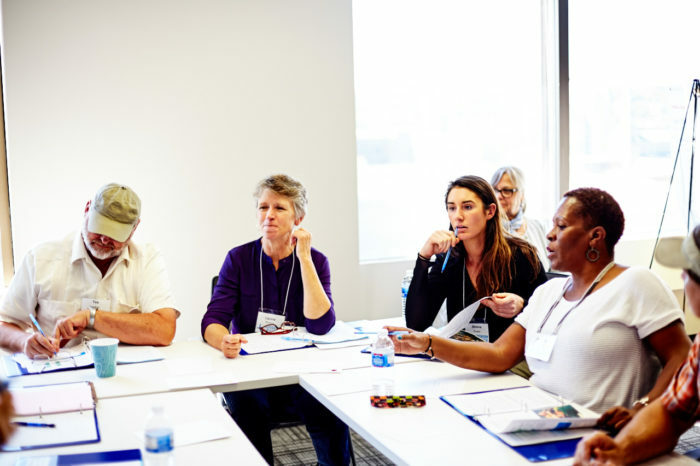 LSP is one of many grassroots groups that works to hold industrial agriculture accountable to communities and the environment for the pollution risks they pose. From this perspective, government has made it possible for the largest industrial agriculture players to benefit from government policy. The Republicans and Democrats have clear policy differences, but as many farmers see it, neither party has done much to challenge those companies’ power. The key to Rural Climate Dialogues’ success, says Anna Claussen, is meeting people where they’re at. “It’s not about ‘bringing people along,’” she says. Photo: Center for Rural Strategies. In Minnesota farm country, the climate change discussion is taking a much more direct form. The Dialogues bring together a selective but demographically representative group of community leaders forming a “citizens jury” panel charged with creating a shared, community-based response to “climate change and extreme weather events.” The project has been able to draw out thoughtful responses to climate change, even from some participating climate skeptics. Just like in a court of law, the jurors decided if an expert or data point was valid, factual, and relevant to their final consideration. “It was positive to focus on the presentation of the history as we know it instead the fear of the climate projections in the unknown future,” Claussen said. The key, says Claussen, is meeting people where they’re at. “That doesn’t mean talking down to them or talking in a different way to them. It’s not about ‘bringing people along.’ This is not an intellectual game.” Rather, she believes it’s a matter of inviting people to work together as stakeholders with an equal amount to gain (and lose) as we move forward into an unknown climate future. In order to follow the advice of meeting farmers where they are, the realities of the farm economy must be front and center. Family farmers that raise livestock and row crops are struggling with low prices and lack of access to markets. Farm incomes have declined steadily since the boom years of 2011-2014. President Trump’s NAFTA re-negotiation and tariff threats with China have shaken up international export markets. Bankers are worried about farmers’ ability to service their debt. Dairy farmers are leaving the business as corporate-controlled industrial dairy factories expand. 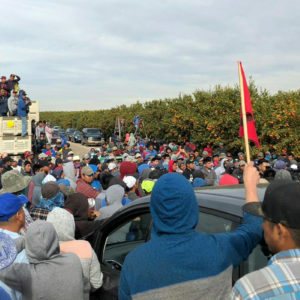 The mood in farm country is understandably sour. It’s possible, though, that the lessons of the Rural Climate Dialogues can demonstrate a way through the politics and the gridlock of the moment. Perhaps agriculture could lead the way to a low-carbon economy by looking at the evidence. To Chris Clayton, the most heartening sign of change is the soil health movement and the rise of farmers like Tom Cotter, and more well-known experts like Gabe Brown. As he sees it, national farmer gatherings such as the No Till on the Plains conference and the Soil Health Institute Meeting are bringing together a growing number of people who appear to be taking climate change mitigation by the horns. The American Farm Bureau Federation opted not to comment for this story. This story is part of a year-long series about the underreported agriculture stories in our rural communities. Exxon knew about global warming in the 1970s. There is no doubt about it according to them. Or to the US Dept of Defense. Proof: Start fresh with record high and low temps for the year. You will have 365 highs and 365 lows, one for each day. Next year, half those records will get broken. The year after, approximately one-fourth of the records will get broken. After 30 years, there will still be new record highs and records lows for random days. If the climate is not changing, there should be about the same number of new highs as new lows. There are 3-4 times as many new high records as there are new low records pretty much across the globe. This article is heavy in generalizations and light on science. What does "organic" vs "conventional" agriculture have to do with climate change. No-till and reduced tillage crop production is a great way to sequester carbon in soil organic matter. Tillage encourages the breakdown or organic matter. Organic farming relies heavily on tillage to control weeds since herbicides can not be used. Also, lower yields from organic farming (25-50% lower) require that more land be farmed to obtain the same total production. This extra land is usually lower yielding and more erosion-prone.